© Studio lost but found / DACS 2018. It is hard to look away from the painfully slowed-down frames of blistered silver film in Douglas Gordon’s 10 ms–1. 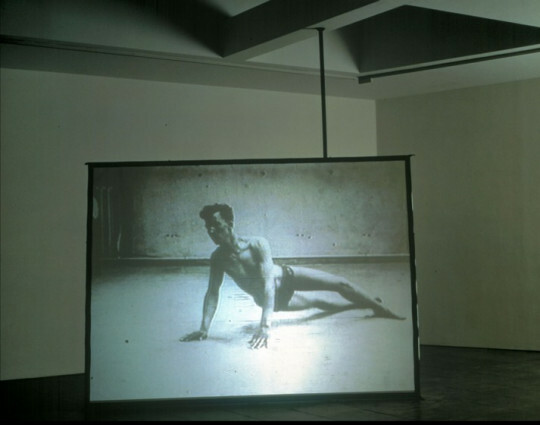 A silent, looped video projection on a large tilted screen depicts a man, who falls to the ground in an almost balletic dive, and then appears unable to get up. His awkward attempts to stand are frustrating and pathetic. The environment is hard and stark – one can make out what looks to be a hard bed to the right-hand side. He is wearing only underwear, adding to his vulnerability; his pale, quite useless limbs appear to thwart him as he tries different ways of getting to his feet. This work follows 24 Hour Psycho (1993), which also employs slow-motion process, and is perhaps Gordon’s best-known work. However, whilst the material appropriated for that work, Alfred Hitchcock’s Psycho (1960), is almost archetypal, part of the reason 10 ms–1 is so effective is because the source footage is unknown. The large scale of the projection renders the figure life-sized to us. The tilting of the screen upsets our own balance somewhat, so we approach the figure in the footage as an equal, identifying with his sorry plight. The man is clearly in distress, inviting our pity and sympathy. Repeated attempts and failures, however, begin to wear on us, and discomfort provokes us to consider what we are watching. Caught in an endless cycle of build-up and failure, we separate ourselves from him. We begin to wonder what is wrong. He looks healthy enough. We might discover that the found footage dates to the First World War, adding a new layer of pathos and historical weight to our reading of what we see. Is the problem, then, psychological? Madness induced by the horrors of war, or shell-shock? Why is there a camera watching this man in the first place, and why will no-one assist him? It may occur to us that the event is staged – a medical document or training video.
. Private collection and Kunstmuseum Wolfsburg. Edition of 2.
. ‘Attraction–répulsion’, Gordon interviewed by Stéphanie Moisdon- Trembley (1996), in Douglas Gordon, Déjà-vu: Questions and Answers, Volume 1, 1992–1996 (Paris: Musée d’Art Moderne de la Ville de Paris, 2000), 110.
. Southampton City Art Gallery and Musée Départemental d’Art Contemporain de Rochechouart. Edition of 2.
. Raymond Bellour, ‘The Instant of Seeing’, in Douglas Gordon, exh. cat. (Lisbon: Centro Cultural de Belém, 1999), 27.